The number of Regional Offices of Education in Illinois will be reduced from 44 to 35, effective July 1. Public Act 97-0703 from June 2012 reduced the student population minimum for ROEs to 61,000 from 43,000, a move expected to save the state $1.5 million annually. 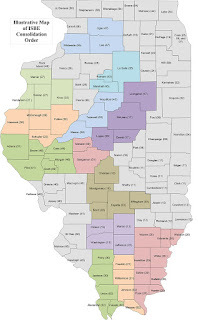 According to the Illinois Association of Regional Superintendents of Schools (IARSS), the consolidation process included combining staffs and office locations, coordinating programs with local school districts, and shuffling management of some educational programs within the ROEs themselves. 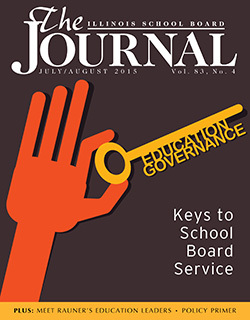 The July/August issue of The Illinois School Board Journal offers new board members, and their experienced counterparts, keys to school board service towards excellence in governance. The issue also features conversations with Illinois’ two new education leaders: state Secretary of Education Beth Purvis and the new superintendent of the Illinois State Board of Education, Tony Smith. In addition, IASB policy experts offer guidance for understanding school board policies and how to establish a policy review cycle. Click here to read the digital version. IASB offices in Springfield and Lombard will be closed on four days in July in observance of the Association’s summer schedule and the national holiday. Both offices will be closed Friday, July 3 and the following three Fridays: July 10, 17, and 24. The new Spring Garden CCSD 178 combines Dodds CCSD 7 and Ina CCSD 8. The new Woodlawn SD 209 is a consolidation of Woodlawn CCSD 4 and Woodlawn CHSD 205. The new Bluford CUSD 318 formed from Bluford CCSD 114 and Webber HSD 204. Nashville CCSD 49 annexed Hoyleton Cons SD 29. Salt Fork CUSD 512 is a consolidation of Jamaica CUSD 1 and Catlin CUSD 5. There are now 850 public school districts in Illinois. 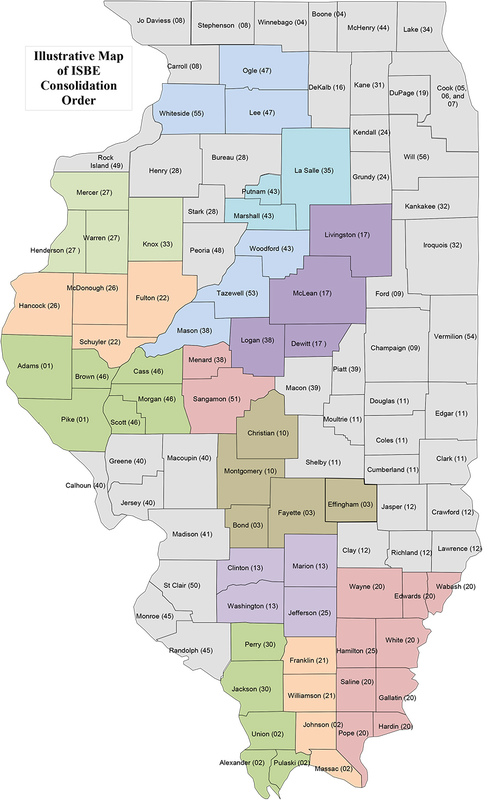 With these changes, and with the addition of Pope County CUSD 1 in Golconda (Shawnee Division), 843 districts are dues-paying members of the Illinois Association of School Boards. IASB is appealing to member school districts to help update Association membership information. Member district listings are shown on the Association’s website, and any corrections or new member updates can be sent to the IASB Records Manager at 2921 Baker Drive, Springfield 62703-5929 or sent via email to jkidd@iasb.com. Deputy Executive Director Ben Schwarm, head of IASB's Government Relations department, provides an update on the extended 2015 legislative session. Governor Bruce Rauner signed into law Wednesday the bill that contains the education portion of the Fiscal Year 2016 state budget. HB 3763 increases K-12 education funding by $240 million over FY 2015 levels, with $206 million going to General State Aid (GSA) resulting in a 92 percent proration. An additional $85 million would be available for distribution to the neediest of school districts through a supplemental grant to entities that receive GSA to limit the loss per student due to proration. The grant would be paid based on the districts with the greatest loss per student. Early Childhood Education gains approximately $25 million over current funding levels under the bill. Click to read the entire Alliance Legislative Report 99-28. The Illinois Association of School Boards is seeking nominations for the “Holly Jack Outstanding Service Award,” and school districts are being encouraged to nominate board secretaries who excel in their post. The award was created six years ago to honor the memory of Holly Jack, a long-time employee of the Association who served as an IASB field services administrative assistant. She was instrumental in promoting and developing the secretaries’ professional development programming offered at the Joint Annual Conference. The award’s purpose is to honor the memory and contribution of Holly Jack and to recognize the extraordinary work and service provided by secretaries who serve and assist their local boards of education. The award will be presented at the IASB/IASA/IASBO annual conference in Chicago on Friday, Nov. 20, 2015. Registration for 2015 Joint Annual Conference and Housing is now open. Forms and instructions are available on the IASB website for both school district and non-district attendees. Recognized as one of the nation's premier state education conferences, the event is open to local school board members, superintendents and secretaries, school administrators, state and regional education officials, school attorneys, university professors, exhibitors, and guests. 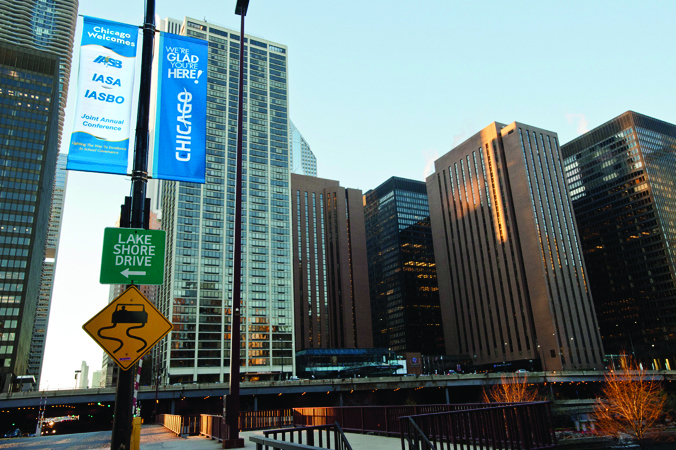 The 2015 conference will be held Nov. 20-22 at the Hyatt Regency Chicago and Sheraton Chicago Hotel and Towers. This will be IASB's 101st annual conference and the 83rd joint conference with IASA and Illinois ASBO. Click here for the Joint Annual Conference page. After announcing a “continuous session” at the end of scheduled adjournment in May, the House and Senate have agreed to meet at the Capitol every Tuesday in June. The reported schedule will give the majority leaders in the legislative and executive branch at least three more opportunities to work out their differences before current budget plan expires on July 1. If the action undertaken this week is any indication, a compromise solution does not appear to be at hand. Read the full Alliance Legislative Report (99-27) here. Pope County CUSD 1, Golconda, is IASB’s newest member district. The district, which is located in the Association’s Shawnee Division, had last been a member in 2009. The Pope County district is served by Field Services Director Patrick Rice. With that addition, the count of IASB member districts now stands at 847, and just eight districts are not members of the Association out of a total of 855 public school districts in the state. Note: there are three fewer districts today in Illinois than last year at this time, the result of local voter approval of three school district consolidations at the Nov. 4, 2014 general election, with none approved since. Voters agreed to combine Dodds CCSD 7, Mt. Vernon, and Ina CCSD 8, and approved the consolidation of Woodlawn CHSD 205 and Woodlawn CCSD 4, as well as the consolidation of Catlin CUSD 5 and Jamaica CUSD 12. Frank Cooney Company, Inc., a provider of furniture for educational environments, Wood Dale, has been invited to join Service Associates. IASB’s Service Associates is an organization of businesses offering school-related products and services and having earned favorable reputations for quality and integrity. Prospective members are screened by the Service Associates Executive Committee, which reviews the candidate firms and then forwards eligible ones to the IASB Board of Directors. IASB currently has 72 Service Associate members. A complete listing of the members can be found online here. A print directory of the membership is also published in each issue of The Illinois School Board Journal. More information on the program, including costs and benefits, can be found here. School boards that learn and practice effective governance behaviors are facing an August 1 application deadline to complete requirements and file their papers in IASB’s School Board Governance Recognition program. The awards program acknowledges boards that display effective governance behaviors as identified in IASB’s Foundational Principles of Effective Governance (see the list of principles online at www.iasb.com/principles.cfm). To earn the recognition, boards must display effective governance behaviors both through participation in and support for board development programs and events. The primary focus is on the entire school board’s development and participation rather than individual board member efforts. Applications are available on IASB’s Members Only website under the “IASB involvement” tab. To help facilitate what boards need to do to complete the application, a checklist is available for download at http://www.iasb.com/training/governancechecklist.pdf. Additional information and details can also be found in a tutorial video, available online. Click on the headline to read IASB deputy executive director Ben Schwarm's comments in this article from the Chicago Tribune.